Oranges are not the only fruit, proclaimed dour northern novelist Jeanette Winterson, and as though in recognition of this ideology, northern mountain bike manufacturer Orange has made a foray away from its burly terrain-munching monsters and taken a shot at the increasingly popular cyclo-cross sector. The RX9 crosser is actually not the company’s first diversion from pure off-road bikes — it’s even had a pop at the road market before with the fantastically distinctive looking carbon-fibre Carb-O road bike. It’s no surprise, then, that the company’s first cross bike is just as vibrant in appearance, dressed in lustrous deep orange (naturally). Looking closer, it’s clear this bike is no token effort to capitalise on a growing market for do-it-all bikes — Orange has done a proper job, with well-thought-out and beautifully finished cable routing along the upper-side of the top tube for less clag catching and easy shoulder carrying, plus there’s plenty to impress in the competent, if not quite blingy, component package. 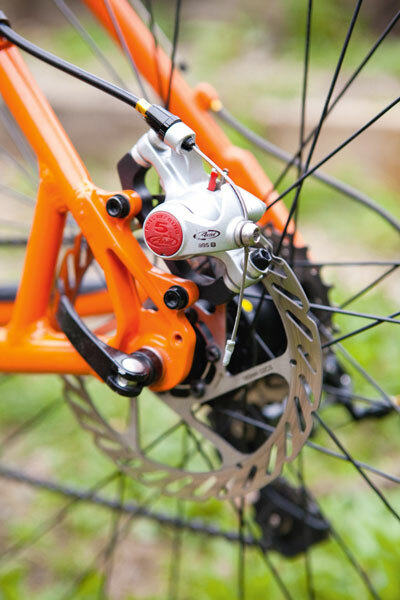 The headset is Cane Creek, the bar, stem and seatpost are Easton and the bombproof-looking wheels are burly Mavic A119 rims housing tried and tested Deore mountain bike-specific disc hubs. At the other end of the road-mtb scale, the groupset is a reliable 10-speed Shimano Tiagra, with a Shimano 105 rear derailleur to spice things up. £1,100 is entering the realms of serious bike money, so it’s great to see Orange has squeezed the budget until the pips squeak to eke out maximum value. The one part of the bike that sticks out as appearing slightly below spec compared to other bikes of this ilk is the fork: it’s aluminium, not carbon. This was a bit of a surprise at this price and we found it hard to believe Orange would spec it merely as a cost consideration, so we asked for its reasoning. “At the price point the RX9 sits at, the fork we were happiest with was an alloy one,” says Orange. “We could have specced carbon but it would have been a compromise too far for us to be truly happy with it. That’s not to say we won’t spec a carbon fork in the future but if we do it will be on a higher specced RX9 variant where we are happy that there is no such compromise.” Experience tells us that a high-quality aluminium fork beats a heavy and low-rent carbon-aluminium number, so we’re happy with that answer — even more so after riding the RX9. That’s because the ride quality of the RX9 is absolutely out there among the best in its class at this price. 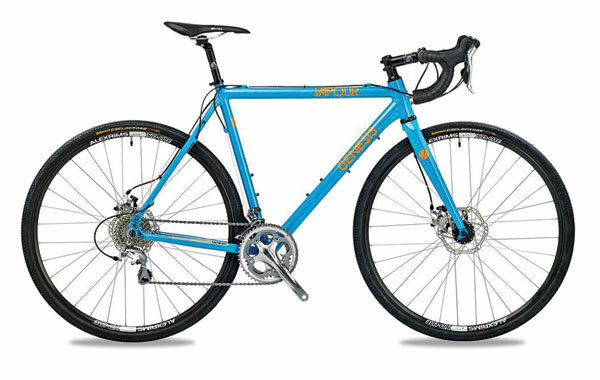 The feeling of speed and efficiency belies the frame’s slack, relaxed angles, yet maintains a superb level of comfort. It’s a fairly long bike, yet still pretty high at the front so there’s an excellent level of control that gives a great deal of confidence both on and off-road that encourages you to thuggishly hurl it into the bends and down slopes with reckless abandon. The riser stem can, of course be flipped, giving a lot more flexibility over ride position too. The brake and tyre choice are also shrewd, really helping to maintain the bike’s multi-purpose ethos and helping rider confidence. The Avid BB5s are up there performance-wise with the more expensive BB7s, they just have a small weight penalty and you can adjust them only via one pad. We thought the latter was going to be an annoyance when the bike arrived with a maddeningly squawking front brake, but after YouTube furnished us with a neat set-up trick involving a business card, it turns out aligning them perfectly is breathtakingly simple. 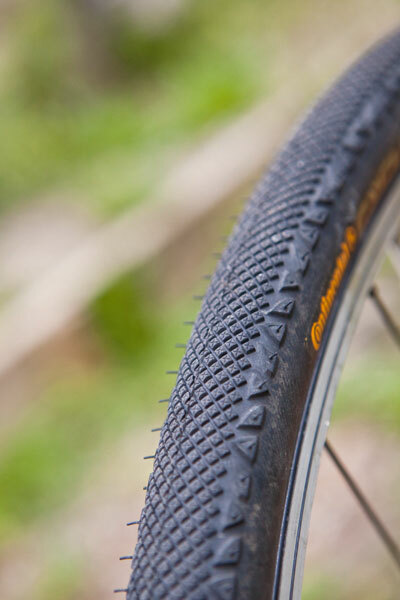 to comfort on rutted tarmac, without being too sluggish, but I also had no issues on soft, wet grass, even while ramming on those disc brakes on slopes. It’s never easy to create that elusive ‘one bike to do it all’ for the all-round rider who likes to tackle a bit of everything but can only buy one vehicle. 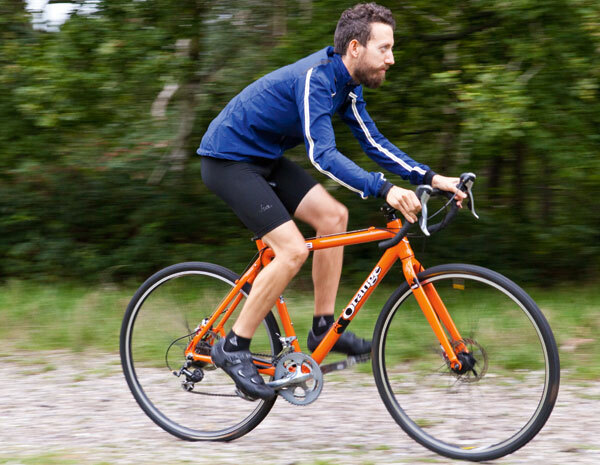 Most manufacturers have now produced their own ‘cross-purpose’, rather than out-and-out ‘cyclo-cross’ bike and despite coming late to the party, Orange’s offering is right out there at the front of the pack. With plenty of zest in the ride and a juicy paintjob, it’s a leader in this increasingly crowded division in both form and function. Previously a direct competitor for the Orange RX9, the real story with the Genesis Vapour Disc for 2014 is that it’s somehow managed to drop its price by £200, so this competent all-rounder package now costs just a grand. 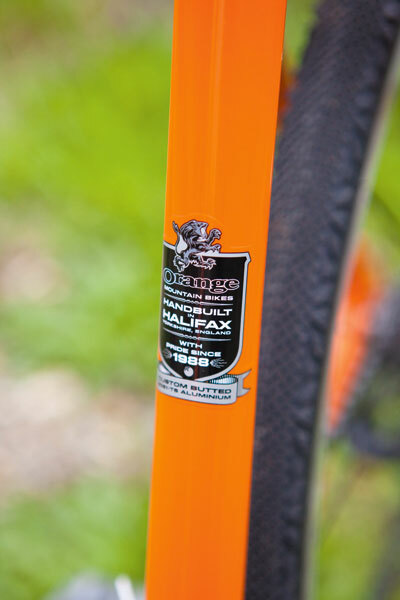 It’s got the British-bred kudos of the Orange as well, plus it has a carbon fork and a cyclo-cross-specific chainset.